Smart Electric Meter Market for 2017 was valued over USD 7 billion and is set to exceed an annual installation of over 190 million units by 2024. Growing demand for renewable energy along with the need for effective transmission facilities will drive the smart electric meter market. The grid integration of clean energy sources to sustain the energy mix protocol coupled with favourable government norms to fortify the deployment of these units will positively influence the industry landscape. Growing environmental concerns along with the national renewable energy targets followed by respective nations will further drive the business outlook. Rising public awareness regarding climate change coupled with stringent government regulations associated with GHG emissions will fuel the smart electric meter market growth. The industry has witnessed a steep growth in the demand for sustainable energy sources subject to the renewable energy targets accepted by over 190 nations in line with the UN Climate Change Conference. In 2016, the Government of Canada pledged to reduce emissions by 80% below the 2005 levels until 2050. The ongoing expansion of microgrid networks along with the rapid development of distributed generation technology will stimulate the smart electric meter market. The regulators across the globe have implemented favourable policies including incentives, feed-in tariffs, leveraging schemes, and subsidies to promote the deployment of clean energy sources. Residential smart electric meter market is predicted to surpass USD 4 billion by 2024. Introduction of government directives and roll-out plans will positively impact the business landscape. Flourishing investments across the real estate industry along with shifting focus toward the development of smart homes will stimulate the product penetration over the coming years. Implementation of government standards and measures toward energy efficiency will boost the commercial smart electric meter market. Increasing deployment of smart meters to monitor and control the energy consumption to comply with energy-efficiency standards primarily across green buildings will encourage the product penetration. AMI smart electric meter market is anticipated to witness growth over 4% by 2024. AMI systems reduce labour costs and provides effective billing generation with their assistance in streamlining the billing process. Over the coming years, it has been anticipated that AMI will gain an appreciable market penetration owing to its capability to avail two-way communication between utilities and consumers. Smart electric meter market is set to witness robust growth on account of rising infrastructure activities. Easy availability, affordable maintenance and low installation cost have necessitated the extensive adoption of AMR systems. AMR technology collects energy consumption data and diagnoses the information from meter devices and transmits that data to a central database for billing, analysing, and troubleshooting. Single phase smart electric meter market will witness growth of over 4% by 2024. Rapid technological advancement along with favourable government measures to up-scale the existing small-scale industries primarily across developing regions will boost the industry growth. Integration of sustainable energy network favoured by government initiatives including FIT’s and incentive schemes to sustain their adoption primarily across residential & commercial establishments will further stimulate smart electric meter market growth. Three-phase smart meters owing to their effective viability across utility-aided transmission networks and large-capacity industrial establishments, possess the majority revenue share. 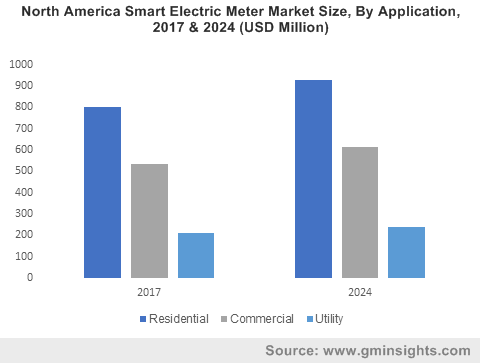 Increasing energy prices and consequent shifting consumer focus toward billing accuracy will boost the U.S. smart electric meter market. Growing number of smart meter manufacturers with technological innovations to facilitate complete integrated metering portfolio and energy management solutions will fuel the industry growth. Increasing funding coupled with government commitments toward full scale roll-outs will further augment the industry landscape. The U.S. market had received a major inclination through the Obama Administration’s American Recovery and Reinvestment Act that approved USD 43 billion for the energy sector and tax incentives. UK smart electric meter market is predicted to witness strong growth on account shifting trends toward digital economy and information society. Introduction of government roll-out targets and initiatives will augment the industry landscape. In 2015, Government of UK introduced a roll-out target of replacing 50 million smart meters across 30 million households by 2020 with an aim to reduce household energy consumption by 5 to 15%. Rapid infrastructure growth along with rising investment to match up the existing energy demand will drive the Asia Pacific smart electric meter market growth. The shifting focus toward renewable energy along with the penetration of smart technologies will augment the industry landscape. In 2016, China developed an investment hub for smart city as a part of country’s 12th and 13th five-year plan. This move enhanced the demand for effective electricity and water monitoring and distributes funds to install smart meters across the nation’s water and electric networks, which, in turn, will institute a favourable business scenario. 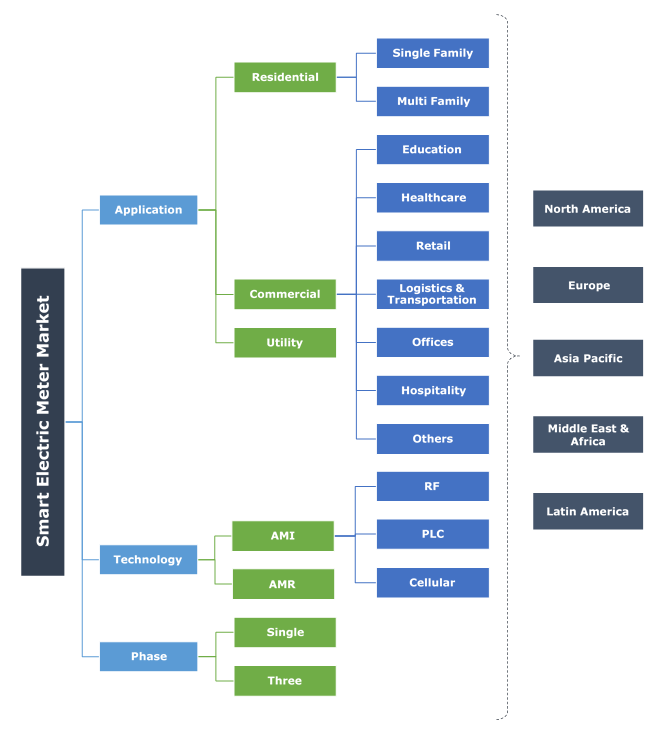 Notable smart electric meter market participants include Landis+Gyr, Itron, Siemens, Schneider, Honeywell International, Osaki, Badger Meter, Neptune Technologies, Aclara, Sensus, Kamstrup, Circutor, Iskraemeco and Apator. In January 2018, Itron, Inc. announced the acquisition of Silver Spring Networks, Inc. The strategic growth venture will strengthen the company’s ability to offer a wider set of solutions and accelerate innovations in the industrial IoT and smart city markets. Smart electric meter is an electronic device that records the consumption of electricity and communicate the information to electricity supplier for billing and monitoring. Radio Frequency modules are embedded within electric meters to enable wireless data communication AMR modules for data collection and power consumption.